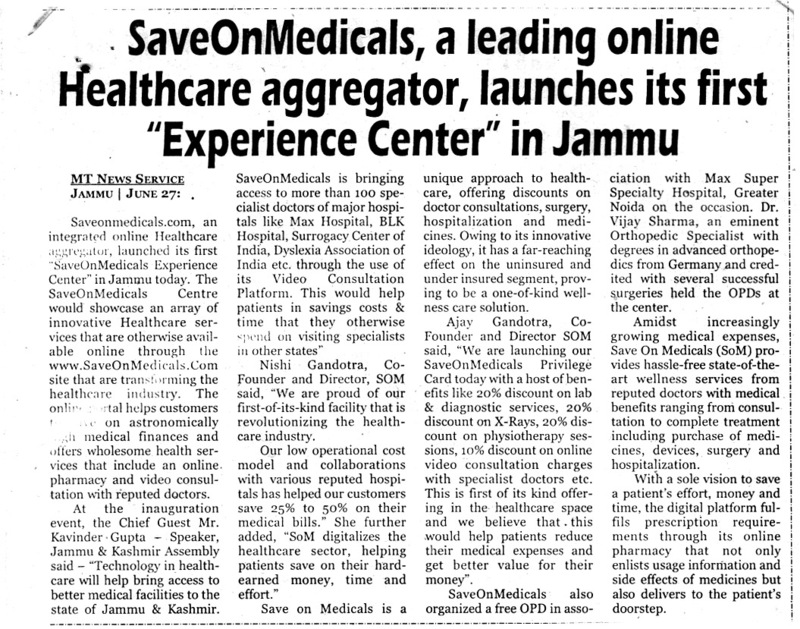 Jammu, 26th June 2016: Saveonmedicals.com, an integrated online Healthcare aggregator, launched its first “SaveOnMedicals Experience Center” in Jammu today. 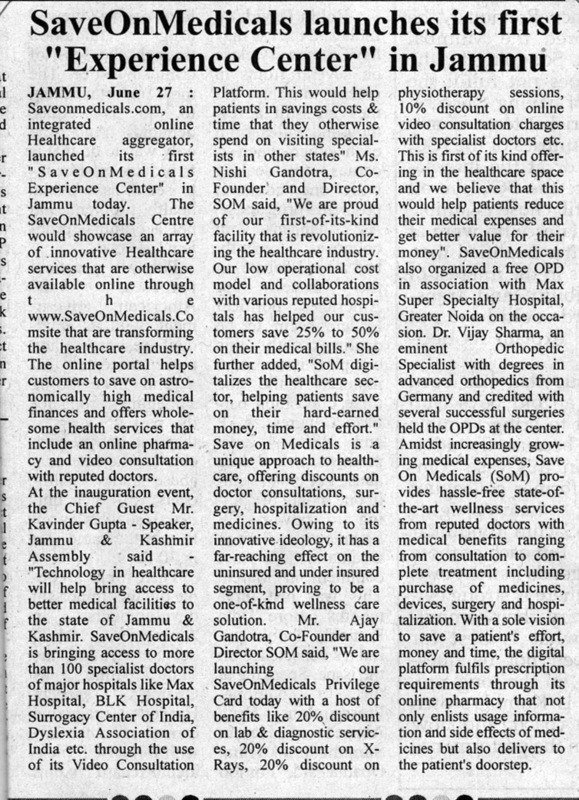 The SaveOnMedicals Centre would showcase an array of innovative Healthcare services that are otherwise available online through the www.SaveOnMedicals.Com site that are transforming the healthcare industry. The online portal helps customers to save on astronomically high medical finances and offers wholesome health services that include an online pharmacy and video consultation with reputed doctors. At the inauguration event, the Chief Guest Mr. Kavinder Gupta – Speaker, Jammu & Kashmir Assembly said – “Technology in healthcare will help bring access to better medical facilities to the state of Jammu & Kashmir. SaveOnMedicals is bringing access to more than 100 specialist doctors of major hospitals like Max Hospital, BLK Hospital, Surrogacy Center of India, Dyslexia Association of India etc. through the use of its Video Consultation Platform. This would help patients in savings costs & time that they otherwise spend on visiting specialists in other states”. Save on Medicals is a unique approach to healthcare, offering discounts on doctor consultations, surgery, hospitalization and medicines. Owing to its innovative ideology, it has a far-reaching effect on the uninsured and under-insured segment, proving to be a one-of-kind wellness care solution. 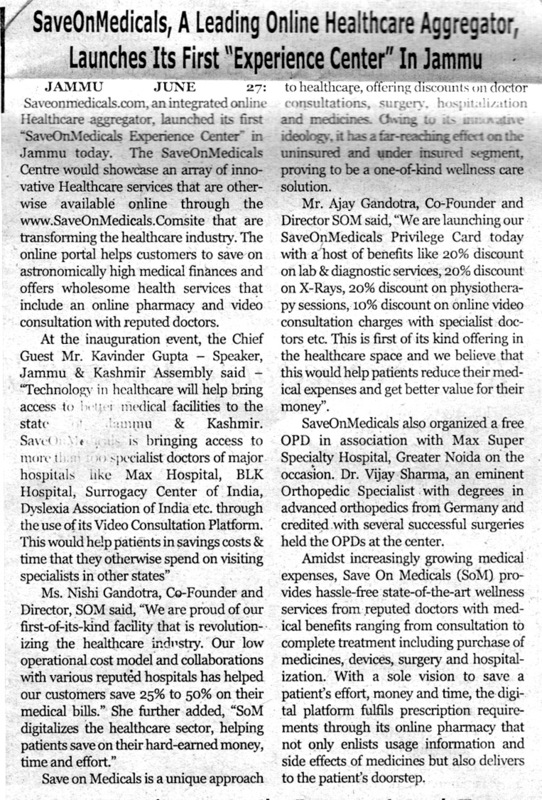 Mr. Ajay Gandotra, Co-Founder and Director SOM said, “We are launching our SaveOnMedicals Privilege Card today with a host of benefits like 20% discount on lab & diagnostic services, 20% discount on X-Rays, 20% discount on physiotherapy sessions, 10% discount on online video consultation charges with specialist doctors etc. This is first of its kind offering in the healthcare space and we believe that this would help patients reduce their medical expenses and get better value for their money”. SaveOnMedicals also organized a free OPD in association with Max Super Specialty Hospital, Greater Noida on the occasion. Dr. Vijay Sharma, an eminent Orthopedic Specialist with degrees in advanced orthopedics from Germany and credited with several successful surgeries held the OPDs at the center. Amidst increasingly growing medical expenses, Save On Medicals (SoM) provides hassle-free state-of-the-art wellness services from reputed doctors with medical benefits ranging from consultation to complete treatment including purchase of medicines, devices, surgery and hospitalization. With a sole vision to save a patient’s effort, money and time, the digital platform fulfill prescription requirements through its online pharmacy that not only enlists usage information and side effects of medicines but also delivers to the patient’s doorstep. Save On Medicals (SoM) is an integrated online healthcare aggregator that provides solution to customer’s 360 degrees’ requirements on medical front in a transparent way. Having a depraved experience from the past, a day came when both the co-founders decided to help people save on their medical expenses, save on their time and derive best consultation possible from the experts – all at one place. 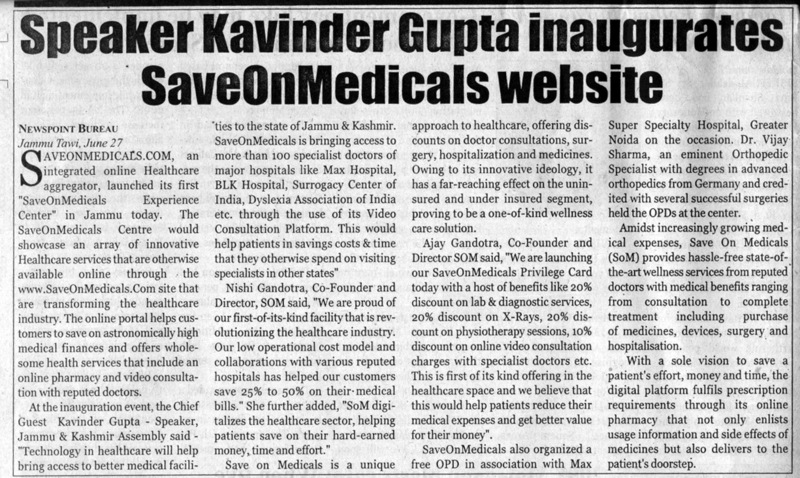 Hence, their passion to help people/patients gave birth to “Saveonmedicals.com”. SoM was incorporated in June 2015 in Gurgaon, by Mr. Ajay Gandotra and Mrs. Nishi Gandotra, with an execution of an idea that fulfilled hassle-free advice from reputed doctors for the patients saving their time and efforts and with provision of medical benefits ranging from consultation to complete treatment including purchase of medicines, devices and hospitalization. SoM intends to help patients across India as well as abroad with the help of technology. In those areas, where patients are still not used to technology in healthcare, it intends to open offline centers where patients will have guided access to doctors. With this idea of assisted e-commerce, SoM intends to help the larger section of society. First such offline center was opened in Jammu today. The company plans to expand its offline center reach over the period of time to whole of India, focusing on those remote areas where medical facility isn’t as upgraded as in metro cities. Originally Published at Pocket News Alert. Save on Medicals (SoM) is an online healthcare aggregator that provides solution to customers’ 360 degrees’ requirements on medical front in a transparent way. 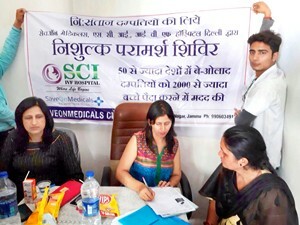 It was incorporated in June 2015 in Gurgaon, by Ajay Gandotra and Nishi Gandotra, with an execution of an idea that fulfilled hassle-free advices from reputed doctors for patients saving their time and efforts, along with provision of medical benefits ranging from consultation to complete treatment including purchase of medicines, devices and hospitalisation. They provide facility to have a video consultation between the patient and the doctor. “Doctor on call through video consultation is a concept that SaveOnMedicals.com has brought for the benefit of all those who seek expert medical advice from the comfort of their homes. Our special focus is on issues requiring confidentiality like psychological issues, sexual disorders or fertility related problems,” informed co-founder Ajay Gandotra. “Doctor on call would be available in "instant / on-demand" route or scheduled appointment route, depending upon one's preference,” he added. So, how does the consultation and fees parameter work? Ajay explained, “We are quite transparent as far as fee parameters are concerned and all the details are mentioned on the website. For example, the patient who is interested in having video consultation can go to the website and choose the doctor themselves, where the consultation fee is mentioned on it. “The doctors have fixed their own fee for online consultation (which is 90 per cent of the cases is either at par with their offline fee or lesser). The customer has to pay online before booking an appointment. Some doctors are giving free consultation also for limited period,” he added. The portal has a PAN India reach and patients sitting in South can also avail their services. “As we are based out of Gurgaon and are in a nascent stage, we do not have registrations from South India at the moment. However, our platform is open for doctors in South as well and they can register themselves on our website/app anytime,” said Ajay. “For next one year, we shall be focusing on the Northern regions. After that, we will focus on South India expansion too, as we receive many queries from patients based out of South,” he said. 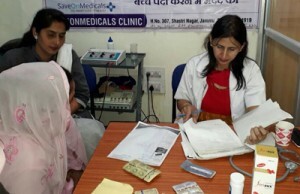 RAJOURI, Apr 30: `SaveOnMedicals’ Clinic, with its objective to serve people in J&K, organised an infertility camp for couples facing difficulty in having children here today. The camp was conducted under the guidance of Dr Sunila Gupta, a leading infertility specialist of `SaveOnMedicals’ Clinic at Jammu with Dr Garu’s Clinic, Rajouri. She examined over 60 patients today and apprised them of the possibilities of having children with the help of latest techniques and procedures like IUI and IVF. Speaking on the occasion, she said that all our earlier camps at RS Pura, Nowshera and Sunderbani had been a great success with a lot of people benefiting from the advice. She also cited a few difficult cases from the Jammu and adjoining areas where the patient were in their late forties and due to the age factor, fertility treatment had become very arduous. 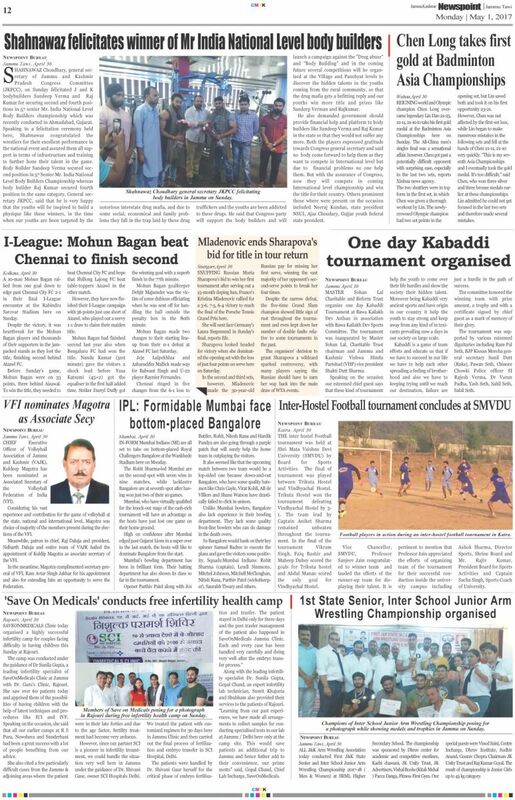 “However, since our partner SCI is a pioneer in infertility treatment, we could handle the situation very well here in Jammu under the guidance of Dr Shivani Gaur, from SCI Hospitals Delhi. We treated the patient with customised regimen for 30 days here in Jammu Clinic and then carried out the final process of fertilisation and embryo transfer in SCI Hospital, Delhi. Along with the leading infertility specialist Dr Sunila Gupta, Gopal Chand, an expert infertility lab technician, Sumit Khajuria and Shubham also provided their services to the patients of Rajouri. “Learning from our past experiences, we have made all arrangements to collect samples for conducting specialised tests in our lab at Jammu / Delhi here only at the camp site. 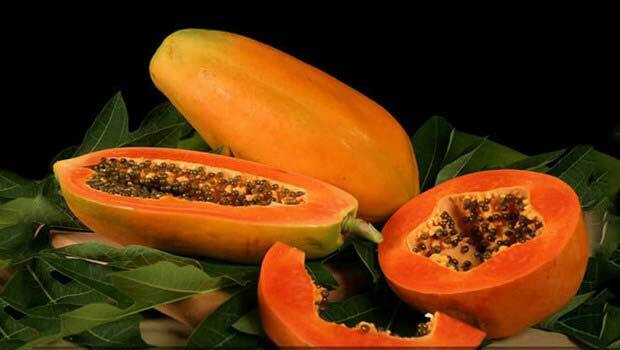 This would save patients additional trip to Jammu,” Lab Incharge said. “We are committed to bring latest infertility treatment to the people of Jammu & Kashmir and today’s free infertility camp was the fourth one that we have conducted in the past month or so, the first one being at RS Pura. 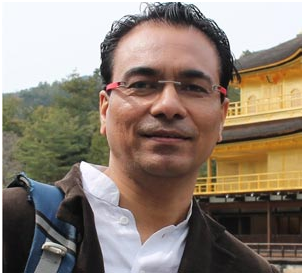 Over the next few months, we intend to reach all towns in the Jammu province with similar camps so that people of other districts can benefit too,” Ajay Gandotra, Director, `SaveOnMedicals’ added.